When Frederick Valentich took off from Moorabin Airport on the evening of October 21, 1978, his objective seemed simple. His destination, Kings Island in Bass Strait, was only a 90 minute flight away. The round trip should only have taken a few hours. While Bass Strait had a reputation for treacherous flying conditions, the weather on the 21st was clear. Valentich, while only 20 years old, had already logged significant flight time and was considered a capable young pilot. He had planned the quick hop to the island to pick up some friends and some fresh seafood, to return with both to a family reunion later that evening. Little did anyone know, that Valentich was about to fly into local history. About forty five minutes into his trip, Valentich reported to Melbourne Air Traffic Control that he was being pursued by another aircraft. Moving at high speed, the unidentified object quickly overtook Valentich's Cesna, and returned to buzz him several times. Shortly after 7 o'clock, Valentich reported that the other was flying directly towards him... after which all contact with Valentich's plane was lost. No trace of him, or his aircraft, has ever been found. 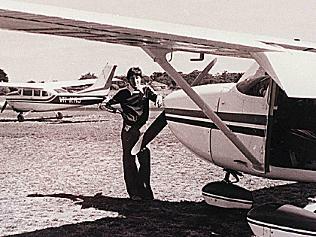 Frederick Valentich with a Cessna, similar to the one he disappeared in. Frederick Valentich had always wanted to be a pilot. It was all he had ever expressed an interest in doing. He was so enthusiastic that he started flying lessons as a teenager, as soon as he was legally able, and by the time he was 18 he had already obtained his pilots license. Valentich would take flights from Moorabin Airport, using an old RAAF training plane, as he built up his experience. Longer term, his goal was to either join the Air Force, or become a commercial airline pilot. By October 1978, Valentich had attained a Class 4 instrument rating, significant for someone his age, and had 150 hours of flight time behind him. Rugged, windswept and scenic, King Island is an isolated spec in Bass Strait, halfway between mainland Australia and Tasmania. Originally settled by whalers and sealers, by the 1970s the Island was well known for its high end agricultural produce, primarily beef and cheese. 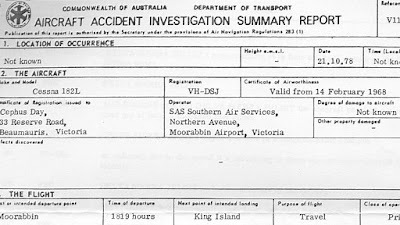 On October 21 Valentich filed a flight plan with Moorabin Airport advising of his trip to the island. Oddly, he did not inform King Island Airport of his trip, and the lights at the small airfield were not turned on. 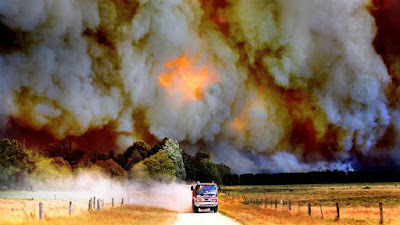 The 235 kilometre round trip was expected to take about three hours. Valentich took off in a Cessna 182L at 6.19 pm, and headed south. At 7.00 pm he radioed back to Melbourne Air Traffic Control as he flew over Cape Otway, on Victoria's south coast, and reported nothing out of the ordinary; winds were light, visibility good. At 7.06 pm, Valentich radioed Melbourne to ask if there were any other aircraft in his vicinity. Told that there weren't, Valentich reported that a large aircraft had just flown over him, about a thousand feet above his own plane. 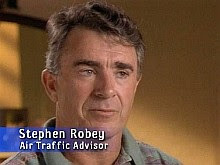 Flight Officer Steve Robey, on duty at Melbourne Air Traffic Control, asked Valentich to identify the aircraft and the pilot told him this was difficult, due to the other plane's high velocity. 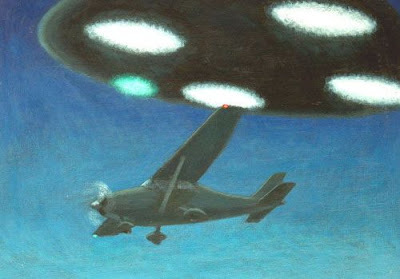 But he stated that it looked metallic and had four bright lights on it, like landing lights. Valentich then told Robey that the other plane had circled above him for a few moments, 'orbiting' as the pilot put it, before vanishing. At 7.09 pm, Valentich contacted again to report that the unknown plane had returned and was approaching him at high speed from the South East. He added that he thought the other pilot was 'playing a game' with him. One minute later, Valentich reported another fly over by the craft, this time from the South West. Asked his intentions by Robey, Valentich confirmed that he was going to push on for King Island. At this time, he should have only been about twenty minutes flying time from his destination. This was followed by 19 seconds of static and white noise. And then all contact was lost. The local press reports the story. Unable to communicate with Valentich, Robey raised the alarm and a Search and Rescue order was issued. Two RAAF transport planes were dispatched to search for Valentich's plane, although the advanced hour and poor visibility meant that not much was done on the first evening. 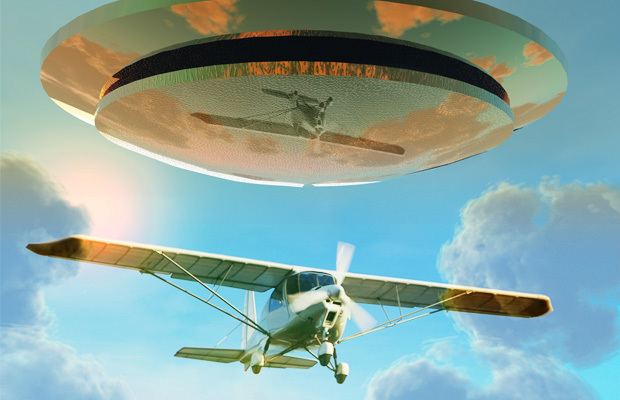 The unusual nature of the incident, and the pilot's own description of encountering a mysterious craft immediately before disappearing, meant that the story would be headline news the following day. The search continued for four subsequent days, but no wreckage or any other physical evidence would be found. 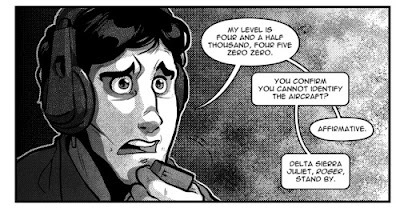 A small oil slick was spotted on the sea's surface just near the Cape Otway lighthouse, where Valentich radioed shortly before his strange encounter began, but a subsequent analysis showed the oil was not aviation fuel and this clue was abandoned. 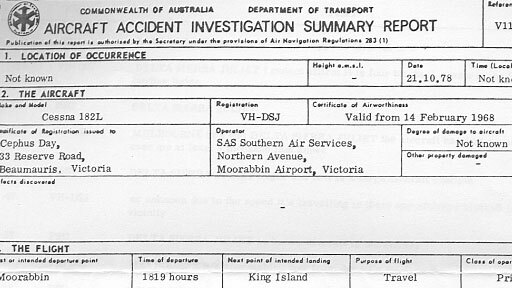 After two weeks, the Victorian Department of Transport would conclude that the cause of Valentich's disappearance was 'unknown,' although it was presumed to be fatal for the young man. And there ended the official investigation. So what happened to Frederick Valentich? 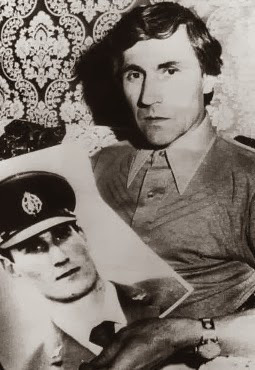 Guido Valentich with a photo of his son. The most likely explanation is that the Valentich crashed his plane. While it was considered unusual that no wreckage was found during the search, this was not thought of as conclusive evidence that he had not crashed into the ocean. The difficulty of any search at sea, combined with the rough nature of the water in Bass Strait, may have caused the wreckage to sink or disperse in such a way to leave no trace. Another difficulty for the search and rescue teams was that Valentich's Cessna was small enough that it did not show up on Melbourne Air Traffic's radar. So there was no way of verifying exactly where Valentich was prior to losing radio contact. The search parameters were based around where Valentich said he was before he disappeared, and nothing more. He could have been mistaken and so inadvertently sent the search party off in the wrong direction. Some aviation experts have also speculated that the young pilot could have become confused or disorientated, attempting such a long flight on his own. He may have even seen his own plane's lights reflected in the ocean and mistaken them for another aircraft. But the lack of evidence meant the field was open for other theories. Instead of accidentally mis-reporting his location, some commentators floated the idea that Valentich could have deliberately mislead Air Traffic Control and used this as a cover to disappear. 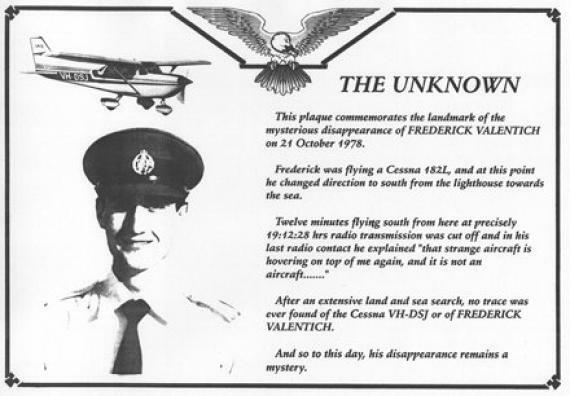 At the time of the incident, Valentich's Cessna would have had enough fuel to fly another 800 km, more than enough to get him out of the vicinity of the subsequent search. He could very well have never been in the vicinity of Cape Otway, at all. But why would he want to fake his own disappearance? Valentich was described as an amiable young man, with no obvious reason for running away. And no evidence has ever surfaced to suggest that he landed his plane anywhere else in Victoria. So if he didn't crash, and he didn't fake his own death, could he have been abducted by UFOs? On the evening of October 21, Melbourne plumber Roy Manifold was driving along the south coast when he stopped to take some photos of the sunset. 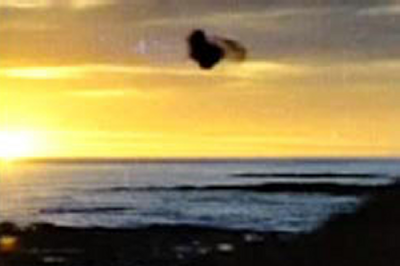 At around 6.45pm, by his estimation, he claims to have seen a large object emerge from the water, several hundred metres off shore, and then fly away at high speed, quickly disappearing from sight. Manifold was able to snap some photos of this event, although they are blurry and inconclusive (the best known of these is produced, above). Other witnesses also came forward to say that they had seen unusual lights in the sky over Bass Strait that night. Barham Valley Rd, where an unidentified witness claimed to see lights. 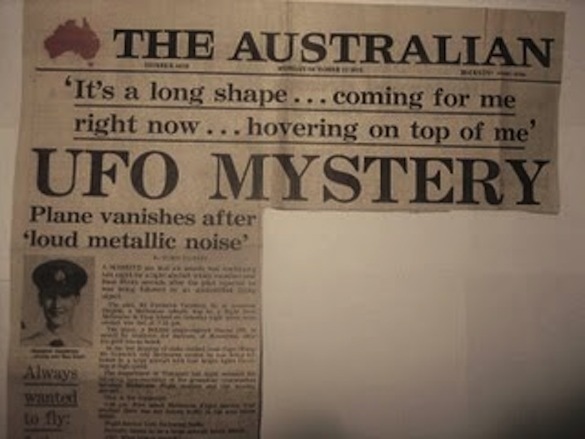 A local man and his two young nieces, never publicly identified, later reported to UFO investigators that they had seen lights near Apollo Bay. Driving home along Barham Valley Road, after a rabbit shooting trip at dusk, these witnesses claim to have seen a set of lights, like those of a small plane, with a second green light hovering above. The man thought the sight remarkable enough that he pulled his car over so he could watch the lights more carefully. The lights were moving from right to left, with a downward trajectory, and it took about 90 seconds before they disappeared from view behind the treeline. The Manifold photos, and the Valentich case more generally, have become a favourite of UFO and paranormal investigators worldwide. A quick google search will return any number of hits on either subject, and a wealth of 'evidence' beyond the points I have listed here. All of which leaves us pretty much where we started. A young man with a love of flying disappears during a short, routine flight, leaving no physical evidence. He also leaves a recording of a strange, eerie radio conversation, where he claims he is being pursued by a UFO, immediately before he vanishes. This points to what was really happening to the poor inexperienced pilot. Distracted by the UFO, he may then have been deceived by the illusion of a tilted horizon. That can happen when the sun has gone down but still brightens part of the horizon, while, of course, the rest of it gets gradually darker farther away. This imbalance of lighting can cause the horizon to appear tilted, so that, in compensating by “leveling” the wings, the pilot inadvertently begins—not to orbit (circle), but to spiral downward—at first slowly, then with increasing acceleration. Further corroboration of this may come from the pilot’s statement that the engine was “rough idling”—just seconds away from his final contact. The plane’s moving in a tightening spiral would cause an increase of G-forces with a consequent decrease in fuel flow, resulting in the engine’s rough running. Or, at that point, the Cessna may have already inverted, producing the same effect because that plane had a gravity-fed fuel system.